My two early children’s books: Me, Molly Midnight; the Artist’s Cat and Runaway Molly Midnight; the Artist’s Cat, gave me the opportunity to work together with my dad. 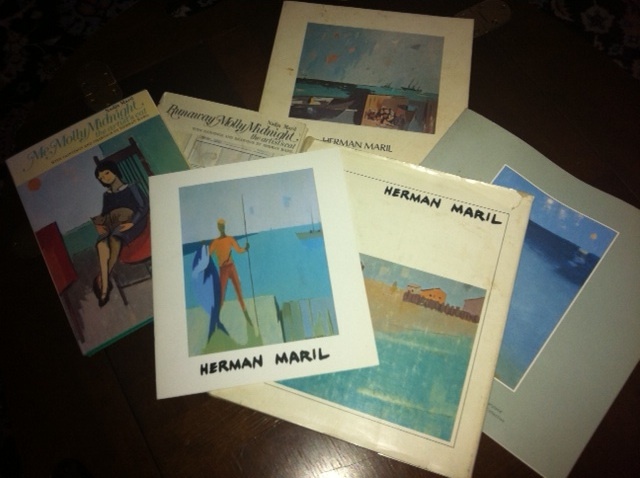 Today is October 13th, my father Herman Maril’s birthday. He died in 1986, but he is very much a part of my life, every day of my life. His artwork hangs on my walls and most days I’m likely to think about something he told me or something we did together, or something I observed about the way he made art a part of his life. The youngest of six children, born in Baltimore Maryland on Park Heights Avenue in a row house, my dad told me he originally wanted to be an engineer and design bridges. He always had a strong admiration for the architectural elements of large beams and girders and evidenced in several of his canvases that focus on construction scenes. He couldn’t afford college. The family was poor. His idea of a delicious snack as a child was chicken fat spread on a piece of bread. A graduate of the Polytechnic High School in Baltimore’s “A Course”, he liked to boast he could have easily been admitted to MIT however he had another stronger interest–painting. At 12 years of age his father registered him for a night class at the Maryland Institute of Art (now known as the the Maryland Institute College of Art ). He lied about his age, to get him into the course. To earn extra money he helped his uncle Herman Becker, a sign painter, paint signs for various Baltimore businesses. This was long ago, before computers when people actually painted signs not only for storefronts but for store hours and clearance sales. Many of his earliest paintings were done on masonite board because it was less expensive than canvas. One of his older sisters gave him money to help pay for paints and brushes. He designed some theatrical sets and programs, taught art and of course kept sketching and painting. A voracious reader and keen observer, he told me that one of the reasons he enjoyed teaching at the University of Maryland, College Park– particularly in the early days, was his opportunity to sit in on classes and interact with the instructors in the English, Drama, Music, and Art departments. My two early children’s books: Me, Molly Midnight; the Artist’s Cat and Runaway Molly Midnight; the Artist’s Cat, gave me the opportunity to work together with my dad. My inspiration was the desire to somehow share with youngsters how pieces of our everyday life can be the elements that inspire an artist. Happy Birthday Dad.